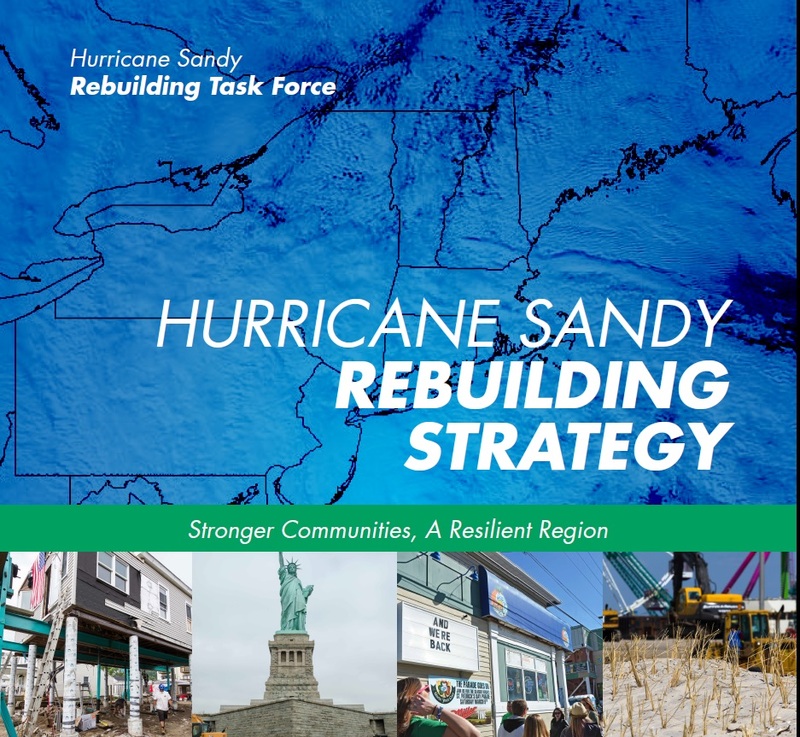 This week the federal Hurricane Sandy Rebuilding Task Force released its long-awaited Rebuilding Strategy, Stronger Communities, A Resilient Region report. Chaired by HUD Secretary Shaun Donovan, the task force compiled disaster recovery and rebuilding recommendations from two dozen federal agencies and departments to help prepare for future weather-related disasters. News coverage of the report has focused mostly on the report’s calls for improved coordination between federal agencies and localities, resiliency efforts, upgrading critical infrastructure and greater attention to the impacts of climate change. It is not surprising that New York City officials reportedly are embracing the report’s recommendations, as addressing climate change has been a focal point of the Bloomberg Administration. Better engagement on proposed use of funds - Both New York and New Jersey have provided minimal opportunities for residents to respond to public comment periods on proposed uses of Community Development Block Grant disaster aid. Regulations require a seven-day write-in comment period. Though New York City provided two weeks for its Partial Action Plan A, it only provided seven days for a proposed amendment to the plan. Nobody wants to slow funds from getting to the people and small businesses that need them, but the Task Force’s recommendation to expand local capacity building rings a little hollow without requiring better opportunities for engagement. Access to funds for undocumented immigrants – The region and New York City especially, have a significant number of undocumented immigrants, many that have lost jobs and housing. As FEMA doesn’t count undocumented immigrants in its needs assessment most assuredly, more resources are needed. Federal officials should require that localities connect with community based organizations for a clearer needs assessment to ensure the region receives the funds that are warranted. Good Jobs New York also reviewed the report’s recommendations with an eye towards transparency, economic development, and equity. We begin here with a look at transparency. We could not agree more with the report’s recommendation for government agencies to be proactive in posting data, particularly related to funds allocated for the recovery and rebuilding. The report also calls for the creation of a central website of disaster relief data from multiple federal agencies, specifically HUD, FEMA, and SBA. Lessons from Hurricane Katrina clearly influenced the recommendations on transparency. Multiple references to the waste and abuse of government funding after Katrina are cited as reasons for greater government oversight of recovery funding and accountability, both within government agencies and to the public. The successful oversight of funds allocated by the American Recovery and Reinvestment Act (ARRA), via the Recovery Accountability Transparency Board – which is also providing transparency of the Sandy disaster relief--reinforces the idea that greater transparency is possible and strongly supported by the public. In line with these recommendations, the Task Force has created a Program Management Office (PMO) to both promote interagency information sharing as well as provide oversight and transparency of the Sandy disaster relief aid. PMO’s data is expected to include performance reports, including data on numbers of people and businesses served and on infrastructure projects that received funding. A public website is expected by October 1. Some local transparency efforts are already in place. In New York City, lists of Sandy-related contracts and expenditures are available at the Comptrollers offices of New York City (found by searching “Hurricane Sandy” in the office’s “Checkbook 2.0” website) and New York State. In New Jersey efforts include The Sandy Recovery Scorecard and NJSandy Transparency. There is a proposal before the New York City Council, sponsored by Brad Lander (Brooklyn) and Donovan Richards, Jr. (Queens) for a transparency website that would provide data on jobs and the amount of aid allocated to specific projects. Enhanced websites like these not only enhance accountability but also encourage public officials in different jurisdictions to engage in greater cooperation. The recommendations in the report are an excellent starting point. But residents in long-ignored communities are beyond asking politely for a place at the decision making table and deserve more from federal officials to help support democratic planning and equitable use of Sandy funds.